1. Preheat the oven to 200ºC, gas mark 6. Place the beans, salad onions, garlic, oil and vinegar, plus a little salt and cracked black pepper in a large ovenproof dish, and toss well. Place the tomato halves, cut side up on top of the bean mixture, and season them. 2. Mix the ricotta and chives together, spoon on top of the tomatoes and bake for 20 minutes until tender. 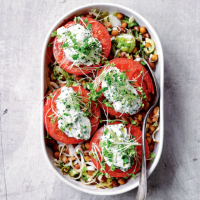 Serve the tomatoes and beans with a sprinkling of cress over the top. 2 of your 5 a day. 35mg vitamin C per serving.